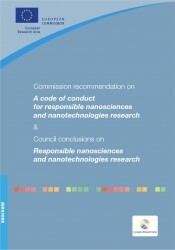 This brochure by the European Commission includes the recommendation to the Member States on a code of conduct for responsible nanosciences and nanotechnologies research. The recommendation was adopted in response to a public consultation held in 2007. The brochure also includes the Council Conclusions that followed the recommendation on 26 September 2008.
worries about risks to health and the environment, as well as for ethics and the respect of fundamental rights.